Finding The Market restaurant on Cape Ann is not simple. To get there, diners must traverse the mazelike roads of Annisquam village. 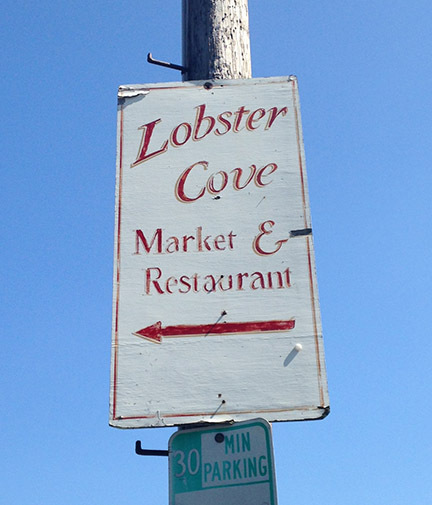 And it’s easy to drive by the place once or twice—the only indication that the modest, shingled shack holds an eatery is a faded sign left over from a previous tenant, the Lobster Cove Market and Restaurant. Still, on just about every summer night, cars line the road in front of the eatery and customers mingle on the deck as they wait for their tables. Now heading into its sixth season, The Market has developed a loyal following of foodies drawn to the restaurant’s ever-changing menu and fresh local ingredients. And the approach has been working. The Market is almost always crowded during the six months it is open. It has been featured in Food and Wine magazine, and celebrities have been known to stop in when they are in town. Though The Market opened in 2010, Nico and Amelia’s story starts years earlier in a different restaurant in California. Nico grew up in Berkeley, just up the street from Chez Panisse, the famed restaurant owned by chef Alice Waters, who is widely considered to be one of the trailblazers of the local food movement. (Waters is also Monday’s godmother.) By the time he was 13, Nico was bussing tables at the restaurant. After high school, he traveled through France and Italy, working in as many kitchens as he could—“That was my cooking school,” he says—before returning to cook at Chez Panisse. Amelia is a Gloucester native. While attending college in coastal Maine, she turned to cooking as a way to occupy herself during the long, snowy winters. When she graduated, she headed to culinary school in the Bay Area. She secured an internship at Chez Panisse. “Basically, I forced myself upon them,” she says. And that position eventually evolved into a job. It was at the restaurant that Nico and Amelia met and fell for each other. They worked together for about five years, absorbing Waters’s simple, ingredient-driven approach to cooking. “That really shaped how we think about food and look at food,” Nico says. Eventually, though, they decided it was time for something new. The couple, not yet married at the time, set their sights on Europe, lining up jobs in Spain. But at the last minute, their visas fell through and they found themselves adrift without a plan. They considered finding summer jobs on Cape Cod, but soon started thinking about a bigger endeavor, a restaurant of their own, perhaps. That first summer, they operated with just a handful of staff, and Amelia and Nico cooked every dish that left the kitchen. They wanted to work with locally grown ingredients but didn’t yet have any relationships with area growers, so Nico’s brother set out in an old Subaru, knocking on farmers’ doors and ask- ing if they had any food they could sell him. Today, the operation has a more regular system in place, but the spirit is still the same. Nico and Amelia are in regular touch with local farmers, finding out what produce is going to be ready and flavorful each week. They buy their fish from local sellers every day. Each morning, often over coffee, they write a new menu featuring the ingredients they have available that day. In spring, dishes might include English pea and goat cheese ravioli or fish stew with local scallops, squid, and haddock. Tomato-zucchini fritters might show up mid-summer, and pork Milanese with bacon-sautéed apples might make an early autumn appearance. Many menu offerings list the farms from which ingredients were sourced. Amelia takes particular pride in crafting a course she says many restaurants too often overlook: the salad. Her versions often include unexpected components like spiced pistachios, tuna confit, and preserved lemon. “We think about salads as much as we do the entrées,” she says. The restaurant space itself, she says, matches the vibe of the food: unpretentious and a little rustic, but demonstrating care in execution. The seating is split between a cozy, window-ringed dining room and a wooden deck jutting out over Lobster Cove, a narrow arm of the Annisquam River. The décor includes an abundance of wood, chalkboards, and checkered tablecloths. The Mondays make improvements to the space every year. They recently added a new bar; this year’s plans include handmade butcher-block-style tabletops, some fresh paint, and new seating on the deck. As Nico and Amelia get ready to reopen The Market after a punishing winter, they have nothing but enthusiasm for the season ahead. Nico intends to get back into the kitchen after spending the last two summers concentrating on the launch and growth of the couple’s second restaurant, pizza-focused Short & Main in downtown Gloucester. Amelia is excited to exercise her culinary creativity. For satisfied diners and happy restaurateurs alike, it seems The Market is quite the find. This story originally appeared in the July 2015 issues of Northshore Magazine, and on the magazine’s website here. To salivate over some of The Market’s recent menus, visit the restaurant’s Tumblr.